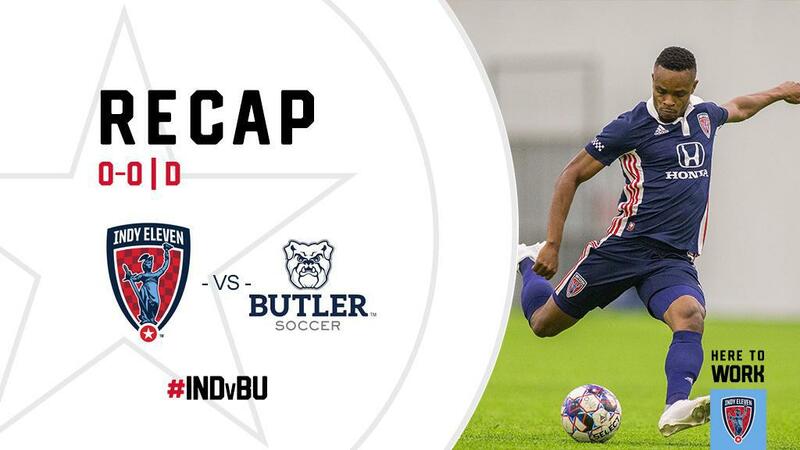 Indy Eleven take Butler University Men’s Soccer to a scoreless draw in the Boys in Blue’s first preseason friendly of 2019. Though scoreless, Indy Eleven Head Coach Martin Rennie thought the impressive display was a largely positive step in preparing for the start of the 2019 USL Championship season. Indy found back-to-back opportunities in the 11th and 12th minutes. New in Blue midfielder Kenney Walker played a through pass to a trialist for a shot from the top of the 18-yard box, but the attempt was interrupted by a member of Butler’s backline for a corner kick. Indy defender Ayoze Garcia placed his set piece in the opposite side of Butler’s box to striker Eugene Starikov for a shot, but the ball beamed just over the crossbar. Butler made retaliating runs eleven minutes later. A chain of passing found the Bulldogs in an attacking position in the center of the Indy’s defensive third. Walker managed to clear the ball away from the top of Indy’s 18-yard box before Butler’s attack amounted to anything too serious. Butler returned to a scoring position in the 25th minute, but the shot from the upper-left corner of Indy’s box lofted safely into goalkeeper Jordan Farr’s gloves. Indy found two more scoring opportunities in 43rd minute. Ayoze’s speed and skill on the ball allowed him to weave deep into a cluster of Butler defenders for a shot inside the 18-yard box, but a deflection off one of the collegiate players sent the ball over the crossbar for another set piece. An Indy trialist sent the ball into the back of the net shortly after play resumed from the corner, but the goal was disallowed by match officials. Indy returned to the pitch in the second half with an almost fully-rotated staring XI, with the exception of Farr and a few trialists. Butler tried to take advantage of Indy’s fresh legs warming up with a shot on target in the 49th minute, but a massive dive from Farr kept the ball from crossing over the goal line. Indiana’s Team quickly upped its tempo, which kept Butler confined to their defending third for much of the second half. Several of Indy’s players looked to make their mark on the match, but it was New in Blue forward Dane Kelly that primarily led the charge. The USL Championship all-time leading goal scorer had a number of attempts throughout the final 45 minutes, with a number of shots skimming over the crossbar or around the post. The Jamaican forward failed to find a birthday goal, but he gave those in attendance a glimpse at what he was capable of. The match ended without flare after four minutes of stoppage time. It’ll be a short turnaround for the Boys in Blue as the club gears up for its next preseason friendly against newly-minted Major League Soccer side FC Cincinnati on Tuesday, February 12 at 1:00 p.m. Coach Rennie will look for his players to quickly regroup and prepare for their next challenge. Indy Eleven look to take on FC Cincinnati in its next preseason friendly on Tuesday, February 12 at 1:00 p.m. at Grand Park Events Center in Westfield, Ind. The match is a non-ticketed event and will be open to the public. Don’t miss your chance to see the Boys in Blue this season. Season Ticket packages for the 2019 USL Championship season are on sale now for a low as $99. Get your season ticket package today by visiting IndyEleven.com/season-tickets or by calling 317-685-1100. Saturday, February 9, 2018 – 7:00 p.m.